And this picture pretty much perfectly describes homeschooling with a preschooler in the house. This was us last year. My daughter would climb onto the schoolroom table and try to gather up as many pencils, erasers, etc as she could. I snapped this picture, because in this moment it was so, so funny to me. Despite the ridiculous distraction of their little sister crawling around on their work surface, my boys were all focused on their drawings. It didn’t always go this smoothly. You’re wondering, “Wait, this is smoothly?” Yes, yes it is. 1. They kept working, 2. I saw the humor and joy in it, and 3. she climbed down peacefully when I asked her to (which was right after I snapped this picture). 1. Include them. For us, that means, as often as possible I include them in our academic activities. For example, they are part of group time in the morning and group time again before naps in the afternoon. My daughter, who is now three years old, will sit for our Bible reading time and Ambleside reading time. She’ll draw in her art book while we “picture, ponder, pray” and explore during our nature studies. During read-aloud time, she can play with a toy quietly or look at her own stack of books. I don’t expect her to understand all or even most of what I’m reading, but I believe it’s still good for her to be immersed in the words. Plus she likes to be there – with us! During nature studies, if we’re drawing birds, I’ll sometimes sketch a bird outline in her book, which she’ll then spend time coloring. Other times, she’ll simply draw by herself. I follow her lead here. The important thing is she is included. 2. Pair them up. It’s one thing to say, “Okay, I need you to play quietly in a different room so I can teach child A their math.” and another thing altogether to say, “It’s time for you and your brother (child B) to play in your room together.” The first suggestion sounds like punishment, while the second sounds like a treat. I’ve decided not to make this a scheduled thing this year, mainly because I can’t plan or prepare one more thing. But, also, because I’m not quite sure what our days will look like yet. And I anticipate with an infant in the mix, no two days will be quite the same. So, it’ll more likely be me asking the one who has flown through their math lesson for the day to play calico critters quietly with his sister in her room while I work with the guy who needs help that day with his math. Know what I mean? It’s a little fluid, but I’m okay with that. Bonus – When I pair my little ones together, it’s sometimes in groupings they wouldn’t naturally tend to. The benefits are great. Just to name a few – they learn to get along well together, they learn to put others first and compromise, and it brings variety to their play. 3. Provide for them. Like me, you know what your toddler needs. Make a plan to have times for snacks, play, and rest. By being intentional you’ll (mostly) avoid scrambling to meet their needs when they’re already half way to whiney town. I’ve also provided a space for my preschooler at our schoolroom table. Does she need to be there yet? Mostly no. But it makes her feel cared for to have her own desk, chair, and notebook. Not only does our 3 year old have a space in the schoolroom, I also make sure she has time to explore the “school stuff.” She loves being able to pretend play with the counting bears or build with the Cuisinaire rods during special school-only times. 4. Pay attention to them. They absolutely need my attention during the day. I’ve learned to set aside some dedicated time at different intervals of the day to spend with my littlest ones. I’ll set my older ones to independent work and read a book, build with blocks, or play a game with my little ones. I like to have one time in the morning and one time in the afternoon. There are, of course, other moments throughout the day, but these two morning and afternoon times I am intentional about. While at first it might feel like you’re losing precious school time, you’re actually gaining in what would otherwise be lost to the distractions of a toddler desperate for mommy time. Plus, it’s just fun – for them and me! It’s hard for me to teach my older ones and care for my younger ones, but spending time together is so very critical for our relationship. The moment I stop thinking of how precious they are to me and only think of the distraction they are causing, I can also feel my patience slipping away. I want homeschooling to be beneficial for our whole family and this won’t work if I don’t give quality time to each of them. On especially busy days, our time can even be spent completing a task. For example, I’ll ask one of them to help me load the laundry or make the morning snack. They love joining me while we talk and work. 5. Teach them. There are two layers of teaching I focus on: 1) academics and 2) training. I use the term academics loosely, but my little girl is so excited to do any bit of “school,” like her brothers that I make sure to give her this. When my five year old was three, he was the same way. For us, that’s simple things like building with blocks and counting how tall our tower is. Or reading a book and picking out what colors are on the page (a la Before Five in a Row). I also take this time to train my little ones how to sit still to listen to a story, to clean up when they’re done playing, and to help with chores. It takes a little bit of time, but when they start to know the routine and expectations I find they do well. And they love our “school” time. Of course, I have to keep my expectations in line, too. I don’t expect my youngest ones to listen for an hour of read-aloud time in one block, so we set our schedule accordingly. Welp, this is the gist of what works for us. It’s still hard, it still takes focus and work, but it’s worth it to me to have all my littles home learning and growing together. What works for your family? I’d love to hear your ideas! And stay tuned! I’m working on another post with easy activities for your toddler or preschooler to do during the homeschooling day. Thank you! 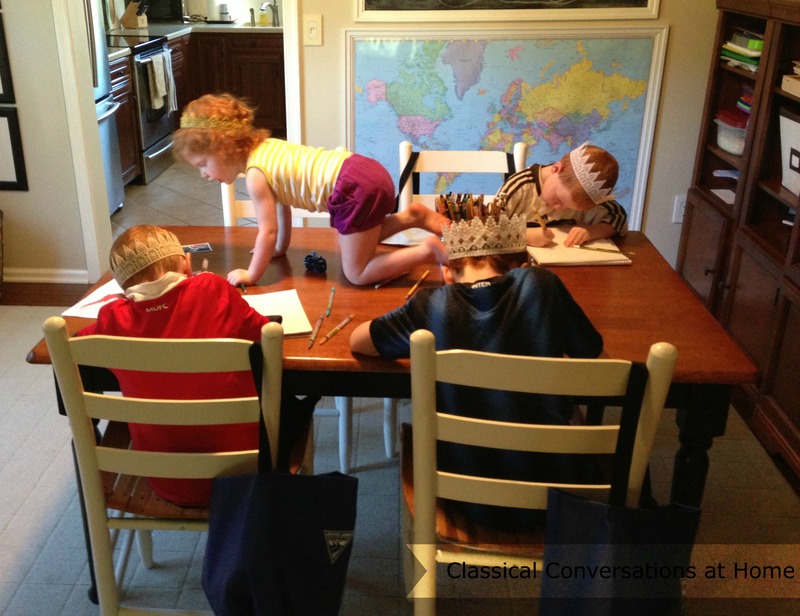 This is a good reminder of why we homeschool — the togetherness of family. Our church offers a very affordable preschool program for 18 mos.-5 years from 9 am-noon. While I REALLY struggled with this idea at first, (all of that nasty mom-guilt!) my husband actually insisted that we send our youngest two (4 and 1) for two mornings a week. They LOVE the time with peers and other teachers and it gives me focused time with my bigs on those days, especially this year as we dive in to Essentials. One day I spend a good chunk of the time on Essentials/IEW with one child, and on the other day, my emergent reader (who loves to be in the kitchen) helps me read and select meals for a menu-plan and then we go to the grocery store. Any extra time is spent planning or we go outside on a blanket and read quietly to ourselves. It’s turned out to be a very special time with my big kids, who often get the left-overs of my energies late in the evening. Mom-guilt be gone! 🙂 I’m so grateful for your ideas and encouragement, Beth! I love this Beth! Right there in the trenches with you, and I’ve found it works so much better to relax and include them as much as possible (my now 4 year old is the smartest little thing and gleans SO MUCH from the past 2 years sitting around the table with us). I always say, mom first and remind myself that my little ones need all the tender care and hugs and kisses I gave to their older siblings. You wrote this for me! Thanks you for the encouragement. I’m right there trying to school with littles and being pregnant and I failed miserably today. Praise The Lord his mercies are new every morning! I’m ready for a redo with an additude adjustment. Thanks Beth!